The utilities sector in Afghanistan is among the least developed sectors in the economy. Only about 15 percent of the population has access to electricity. […] To promote political stability, providing sufficient electrical power has been important for both the capital city of Kabul as well as for the agricultural provinces of Helmand and Kandahar. The Governments of Afghanistan and the United States became increasingly concerned that Afghanistan’s North East Power System might not be able to provide sufficient power to Kabul by the winter of 2008–2009. Furthermore, the Kajakai Dam hydroelectric power plant has been considered a vital component of the South East Power System in Afghanistan, which provides electricity primarily to the provinces of Helmand and Kandahar—the agricultural breadbaskets of the country. 1: Task Order 9 was awarded in July 2007, with an objective to build a diesel-powered electricity generating plant that would provide 105 megawatts of additional generating capacity in Kabul by the 2008–2009 winter season. This task order had a completion date of April 2009. 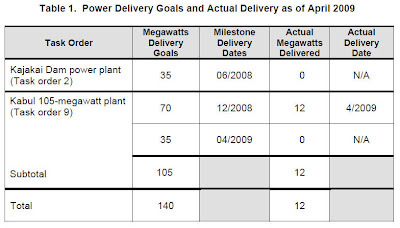 Results: As of May 13, 2009, when audit field work ended, the mission-funded projects were able to deliver only 12 megawatts of power, far less than the original goal of 140 megawatts. Moreover, this modest increase in power had not actually been delivered by the new Kabul power plant to the city’s population. By that date only 3 of 18 planned generators had been installed at the plant, 2 of which could generate the 12 megawatts of power. The third generator installed at the plant—which the project had expected to generate 5.8 megawatts—had yet to undergo startup and testing activities. So -- in addition to building the power plants at a total cost of $305.5 million (that have yet to be operational), US taxpayer funds have also been expended to purchase fuel because the host country could not afford to buy it. How long are we supposed to be responsible for the procurement of fuel for this country? I mean seriously -- did we legally adopt Afghanistan while we were all asleep? Twenty years later, it’s hard to disagree with the officer who led the ground forces in the Soviet invasion of Afghanistan. Yes, let’s do that --- sort out the economic assistance. It’s not like we have a surplus to brag about.